FPAC recently found out about an awesome tool hidden in Microsoft Word that few of our friends know about. This tool will score the readability of your document based on U.S. grade reading levels. FPAC values equity and accessibility, and this tool has helped us make some of our documents more accessible to the public. We know our friends are interested in using this tool, so we’re sharing how to test the readability of your documents here! 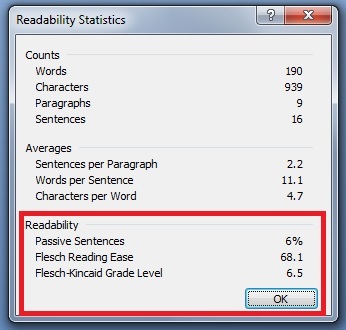 Microsoft Word has a readability function that scores the readability of your document. It gives you scores on two tests: Flesch Reading Ease and Flesch-Kincaid Grade Level. Flesch Reading Ease rates your document on a 100-point scale. The higher the score, the easier it is to understand your document. Word recommends aiming for a score between 60 and 70. Flesch-Kincaid Grade Level rates your document based on U.S. school grade level. A 5.0 score means that a fifth grader can understand your document. These tests are based on two factors: sentence length and syllables per word. You can make your document more readable by shortening the sentence, and using words with fewer syllables. Click the Microsoft Office Button for the main drop-down menu, and then click Word Options. Now, whenever you click on spell check, the overall readability score for your document will pop up. To check the readability score of a specific sentence or paragraph in your document, copy and paste the language into a separate word document and run the scan. We hope you find this tool helpful, and share it with your friends and colleagues!